McLaren's Lewis Hamilton says he needs to improve if he is to win the Formula One world title in his debut season. The Englishman leads Fernando Alonso by 12 points in the championship standings after coming third in the British Grand Prix behind Kimi Raikkonen and Alonso. 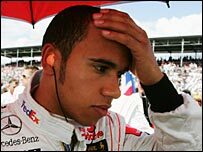 Hamilton, who produced his least competitive performance since Malaysia in March, said: "I need to step up my game, which I intend to do. "I'm still learning. I have to find time in myself through experience." Hamilton led Sunday's race from pole position until the first stops, but he fell back and eventually finished half a minute behind his two rivals. His pole position came through running a lighter fuel load than Alonso, and he struggled compared to the Spaniard throughout the weekend at Silverstone. 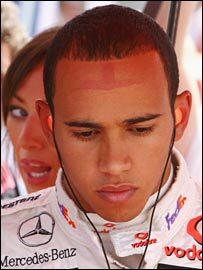 But McLaren managing director Martin Whitmarsh said Hamilton was being too hard on himself. "I think that's the sign of a great driver - even when they're doing a fantastic job they still want to raise their game," Whitmarsh said. "That's what makes them the great, great drivers that they are. By any measure, nine races, nine podiums is extraordinary, isn't it? We all forget where he is in the learning curve. If he didn't have something to learn, it would be a worry. "And despite the incredible success he's had this year he still wants to be better. Anyone who rationally looks on, he's done a fantastic job. "Fernando has done an exceptional job this weekend and was incredibly strong throughout qualifying as well. They were both driving above the car to put us in that position. "The drivers, both of them, are doing a good enough job to win both world championships. We've got to make sure we improve the car." Hamilton added: "As a team we need to push as always, but try to push even more if we can. "We are going to a few tracks that I know so it should really make the weekend a bit easier, but it doesn't. "I've been here before, but I've struggled in terms of pace. [The key thing is] making sure we get the car set up right, making sure we keep on moving forward with the car and ideally beat the Ferraris." Raikkonen appeared to have the edge on McLaren all weekend, and Alonso said he did not think it had been possible to beat the red cars. But for the first time in a long time the Spaniard had a significant advantage over his team-mate. Hamilton said he had not been satisfied with the car all weekend, and he had struggled in particular through the first part of the Silverstone lap, where there is a preponderance of demanding high-speed corners. "I think we made a wrong decision, or I made a wrong decision, with the set-up," he said. "I chose a different rear end from Fernando and I think it really caused me problems during the race. "Even in qualifying we didn't really have the pace that I should have had, but it was too late by then to change the car. "It's a good lesson. We've come away with a ninth podium position, most consistent driver here, I think, and I have to be happy with that. And we have to look forward and hope to do better in the next race."